The Chennaiyin FC U-15 team suffered a 1-0 defeat to Great Goals U-15s in the former’s opening fixture in the 2018-19 Hero Junior League at the SSN College Ground here today. A defensive error led to Great Goals’ solitary goal in the second half as the CFC U-15s suffered their first defeat in the Chennai zone. 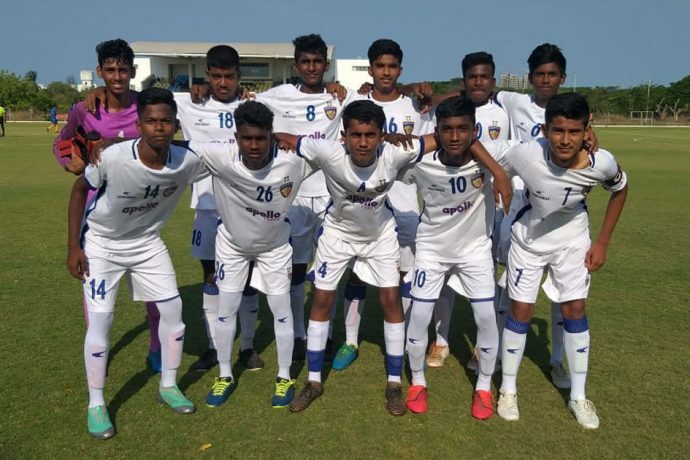 In their debut campaign last year, the CFC U-15s had qualified for the final round of the competition after winning the Chennai zone with an unbeaten record. The CFC U-15s will take on Raman Vijayan Soccer School (RVSS) U-15s in their next outing at home at the SSN College Ground on Friday 12th April 2019. The action began on an even keel, with both sides creating inroads from the flanks. For CFC, skipper Deepak Thapamogar was pulling the strings in midfield as Neyveli striker S. Yugan provided the threat upfront alongside strike partner K. Suriya, who has been promoted to the U-15s after a stellar 21-goal season with the U-13s last year. Chennaiyin shaded possession in the first period, creating frequent opportunities to take the lead. Yugan had the best chance of the lot, when he went one-on-one with the keeper, only to put his effort wide. His strike-partner Suriya was also guilty of giving away possession after some promising build-up. Great Goals at the other end were also proving a threat. They managed to draw two decent saves out of CFC keeper Aron R. in the first period, while the center-back pairing of Caron Kennedy and N. Sivamani held fort on other occasions with their astute defending. The second half began on a similar note as the first, with both sides going should to shoulder. Great Goals then took the lead in fortuitous circumstances following a defensive mix-up by CFC. Dhruv Ganapathy took advantage to give Great Goals the lead. In search of the equalizer, Chennaiyin made a couple of changes in the offensive half. Kishore R.A. and Manish Kumar entered proceedings in place of Rahul and Kuganeshwaran. However, despite Chennaiyin’s best efforts to draw level, Great Goals held on for a narrow 1-0 win.